Markle entering the Endeavour Fund Awards. She isn’t a royal yet, but Meghan Markle has rapidly ascended to the uppermost echelons of global celebrity, and that means her clothing choices are already big, big business. Almost immediately after she and Harry confirmed their engagement, there was talk of a “Meghan Effect” that might even compete with the halo Kate Middleton bestows upon brands—and for an entirely different set of retailers, judging by her first public appearance carrying an Everlane tote that sells for a comparatively affordable $165. Kate’s style has evolved to suit her role as eventual queen; her husband’s grandmother dresses conservatively in everything but color (and there, she opts for a dizzying array of eye-catching shades that make her visible as an interstate highway billboard to people who’ve come to see her). As Harry will almost certainly never get the top job, Meghan has a lot more fashion leeway. And she’s traditionally opted for a look that wouldn’t put you out of place in a relaxed Manhattan corporate environment—meaning there’s new people likely to wonder where exactly she did get that top. One place they can go: What Meghan Wore, the sister site to What Kate Wore and What Kate’s Kids Wore, stalwarts of the royal fashion blog universe. Susan E. Kelley founded What Kate Wore in 2011, an outgrowth of another blog, connected to an online retail business she and her husband were running. “I noticed that whenever I wrote about Kate, the hits would go way up and people just seemed more engaged,” Kelley explained. She launched the blog and eventually added an offering dedicated to the duchess’s children, too. She was early on the scene, but in the years since, an entire online ecosystem has proliferated, dedicated to tracking the specifics of various royals’ wardrobes. With the arrival of Meghan on the scene, she’s partnered with another royal style watcher, Susan Courter, who takes point on the sister blog What Meghan Wore. 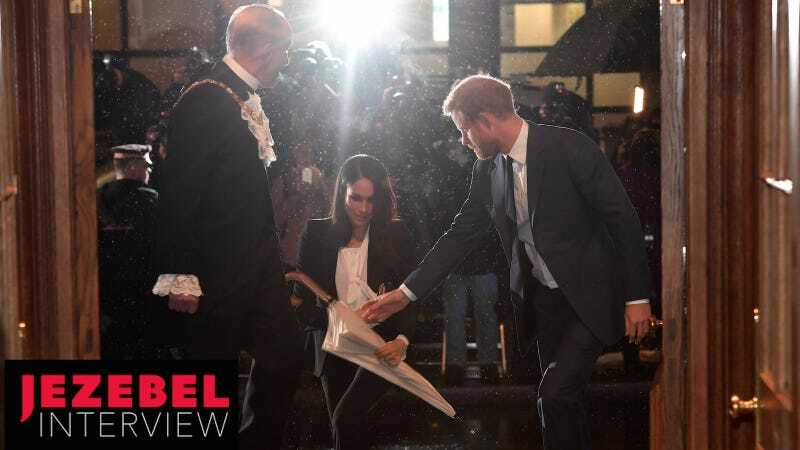 Curious to get a peek inside this somewhat familiar world, I chatted with Kelley and Courter about their work and their thoughts on Meghan’s choices. Come for their highly educated speculation about the royal wedding dress and the rest of Markle’s ensemble on the big day; stay for a fascinating glimpse inside the pocket universe of royal fashion followers. Our conversation has been edited for clarity and length. JEZEBEL: How do you do what you do? I’m amazed how quickly the blogosphere can identify exactly what Kate or Kate’s kids or Meghan wore. Obviously I don’t want to ask you to give away the secret sauce, but what’s your process? Susan Kelley: It’s changed with the technology and with the audience. Initially, when I was doing Kate by myself and there weren’t other blogs, it might take me three hours to find something. And you felt great! Then as more and more people started following Kate and other royal family members, it became a situation where sometimes, particularly with the kids, because there’s specific designers that Kate goes back to, constantly, that can be relatively easy. Attending the Invictus Games Reception. A lot of it is this group of people on Twitter. Kensington Palace will designate a reporter at each event, and they will say, “the Duchess of Cambridge is wearing Catherine Walker. With Meghan, they’re much more forthcoming with information, and they will name four or five labels. Susan and I have recognized that this terrific group of people who identify stuff, you know, they’re there, and there’s no way that we’re going to get stuff identified before they do, and the best thing to do is be grateful for their skill. And we always give credit. When somebody identifies something, they need to be recognized and give their Twitter name and whatnot. The other thing with Meghan, though, is that Susan is kind of the Meghan wardrobe whisperer. She’s bought things before Meghan bought them. The same item! So particularly with Meghan, I kind of step back. But I think Susan would say we both feel like when people can identify things almost instantaneously, our time is better dedicated to getting things on Facebook and Twitter and starting to write the blog. Then when it becomes something very involved—recently there was a pair of earrings that she just researched and researched. She’s a research goddess, and she found them. If it’s going to be something complex or involved that’s not readily identifiable, it’s better to direct energies towards that than trying to figure out precisely what Theory top Meghan’s wearing. Susan Courter: One of the things we both feel very strongly about is getting the information accurately out to our followers and readers, and not just throwing something out there quickly to say, oh, look, we think this is it, to make a quick dollar or something. We want to be sure that if there’s somebody following us, they’re getting that accurate information. If we’re not sure, we’ll say we think this could be it, but we’re not sure, and as we get more information, we’ll update. There are these followers out there that want to purchase what Meghan or even what Kate was wearing, and if they’re spending hundreds of dollars on a piece and then they find out that wasn’t exactly it, they’ve spent all that money and they’re disappointed. I’ve seen it happen. There’s definitely some ugliness in people’s feelings about Meghan, and there’s a dynamic that I think is probably class-driven and racist-driven and a bunch of other adjectives that you could use. From the way you guys are describing it, it sounds like any other kind of beat reporting. If you were starting from zero, you know, it would take you days to come up with it. But if you’re really educated about the brands each woman likes, you can start with educated guesses. Kelley: That’s interesting because I’d not thought of it that way, but way back when I started in TV, that was kind of my genre, was cops and courts. And it is really similar to that, in terms of knowing the little niche area and focusing on that. Prince Harry and Meghan Markle speak with delegates from the Commonwealth Youth Forum. One thing I’m curious about, when you started, you said there weren’t a lot of people doing this. And also the texture of the internet was just different—Twitter was different, Instagram was different. How has this game changed since you started? Kelley: Just the volume, I think, is an enormous change. The explosion in the social media sphere. In some ways it’s been outstanding. It’s terrific because there’s just that many more people involved in a common interest. The downside is in some ways it’s become—a good word is more competitive. I’ve never perceived it as a competition, perhaps in part because as a writer I’m a very slow, pedantic, methodical writer. I’m not a fast writer. I’m never going to have a post up before anybody else. And I’m okay with that, because as Susan Courter mentioned, we’d much rather be accurate. In TV, as a manager, I’d tell reporters, photographers, it’s better to be late and great than first and worst. Because especially with social media, once you get something out there, as you know, it takes on its own life. And if it’s wrong, the Daily Mail grabs it, they don’t know, so it’s published everywhere and even though there’s very little attribution, you just kind of feel lousy if you get it wrong. And then, I think one thing we’re seeing with Meghan that I had not seen previously, and I think Susan Courter would concur, is there’s kind of a coarseness. There is—I don’t know. There’s definitely some ugliness in terms of people’s feelings about Meghan, and there’s a dynamic that I personally think is probably class-driven and racist-driven and a bunch of other adjectives that you could use. That people just seem not only more comfortable in getting out there and saying it—they’re out there to stir the pot. They’re out there to really be very vocal and as high presence as they can get, with really nasty, ugly attitudes. And I don’t know how much of that is a reflection of social media, how much of it is a reflection of the current political climate in the country, in the U.S. and somewhat in the U.K. I would say that is the downside that has taken some of joy if you will, or some of the fun out of what we do. I’m somebody who’s very, very grateful that I get to do this for a living and it allows me time to do volunteer stuff and visit my elderly mother and whatnot. I’m immensely grateful. But there’s now this element of it that’s just kind of ugly. I don’t know, Susan, you’ve watched it for a while. Markle’s first official appearance with Harry, at the Invictus Games. Courter: You know, I’ve seen a lot of the different social media platforms. I visited Tumblr, which can be really cruel and I think more so on there, because people can be a little more anonymous, which is a shame, and the Twitter universe, with a little here and there on Facebook, more so in the past several months. And the way all these social media platforms have built out and that there’s not a lot of controls built in. I think though we’re going to see this change, especially in light of what’s happened recently with Facebook. We’re seeing a lot of these privacy and notifications come out from Instagram, Facebook, and Twitter. We’re going to see a lot more of that, and maybe people will start to reign a lot more of this in and we could see the whole dynamic of the platforms change a little bit. Who knows. Are people just hypercritical of things Meghan chooses to wear or the way she chooses to style herself? Kelley: I think some of it is genuine—you find some of that with Kate or with Sophie. There are some blogs that follow Sophie and European royals and whatnot. Some people tend to be hypercritical, down to the tiniest detail. There really has been Tweets and blog comments—“I wish that one strand of hair hadn’t been there.” But I also think that with Meghan there is this added element that there’s a group of people who are looking at it for just pure pleasure and they enjoy it and they enjoy Meghan and they enjoy learning about different labels, which is part of following Meghan, as opposed to Kate. But I also think there’s a subset that is watching it and doing it to be hypercritical. We want to be sure that if there’s somebody following us, they’re getting that accurate information. Courter: They tend to maybe jump on Meghan a little bit more, a few of them, not everybody. And I think that some of them are being a little more protective of Kate, at times, where they’re not as accepting of Meghan because they’re so used to seeing Kate in this more maybe conservative light, where they feel like, oh no, somebody’s invading our Kate territory, kind of thing. You’re going to find that. Eventually it’ll settle down and they’ll say, well, Meghan’s here to stay. Her and Harry are not in direct line for the throne, and so they can be a little more relaxed in the way their fashion is and everything that they do. People have to remember that. And it seems like that’s a very old story, if you’re not in direct line to the throne. Princess Margaret got to wear Dior. Kelley: That’s a really good point. People do tend to forget that. That’s I think for some of us part of the appeal of Meghan. It’s similar to what happened when I started following Kate more closely. I learned about a lot of new brands. I wasn’t familiar with Reiss or L.K. Bennett or Hobbes. Catherine Walker I knew because Diana had worn her. But Meghan is wearing a lot of brands that I personally had not been exposed to and I think that’s great fun that is some of the appeal for Meghan fashion followers and What Meghan Wore readers or other Meghan blog readers—is that, in part because of her position Kate has settled on this core group of designers and in part because of the sort of engagement she does, you don’t see her as often in these more accessible brands. There can be two strong females married to Diana’s two sons and they are not having a fashion smackdown. They are not having spats. Whereas with Meghan, you do see that. You do see the $50 necklace or bracelet or the Everlane tote. Things that many of us could buy. That is a great source of interest and something people really do enjoy with Meghan. A lot of that does relate to the fact that she can wear things that are a little hipper, a little edgier or trendier. It’s just a refreshing change. It doesn’t mean that you can’t still enjoy what Kate wears. I think part of the dynamic is that there are some Kate followers who somehow think it’s, I don’t know what the word is, disloyal? They don’t see that both women are on the same team, and there can be two strong females married to Diana’s two sons and they are not having a fashion smackdown. They are not having spats. And my personal belief—and I think Susan concurs—is that I think that Kate has helped Meghan ease into this whole massive machine of the British royal family, and that Meghan may have helped Kate with her public speaking skills. So to the contrary of “they’re always fighting” or whatever the tabloids come up with, I think they support each other. Courter: I think we’re also going to see, possibly, some influence in Kate’s style. I’ve said this a few times. Part of that was when Kate was in Sweden and Norway and we saw quite a bit of Erdem. I get this feeling that we could see a little more playfulness and whimsy come back in Kate’s wardrobe, and that influence coming from Meghan, without Kate losing a lot of her conservative style. I just get this feeling it’s something we could see come into play. Kelley: I think this is one place where Susan Courter and I diverge a little bit! We are not in lockstep on all this stuff. Markle attends an Anzac Day Service of Commemoration and Thanksgiving at Westminster Abbey in April. Courter: No we’re not! We don’t always agree, but we agree to disagree. Kelley: That’s one I’m not sure that we’ll see. It’s certainly possible. But I think that Kate has moved to this place where it’s pretty much a uniform, and she may not want to be any more experimental than she’s already been. It would be fun if I were wrong. That would be cool. But I think that’s where she is right now. Especially with a third child, my sense is—this is it, this is what I wear for work, because she recognizes it is her job, and she’s not going to diverge from that path tremendously. Susan Courter, I did want to ask you—Meghan Markle is coming into the family as a grown woman who’s defined her style already. But she’s stepping into this big new role. Are you seeing her personal style start to shift to fit that role at all? Courter: She’s already shown that in these formal events, Commonwealth, most recently when she wore Amanda Wakeley and just last week when she wore Emilia Wickstead, she has shown that she can wear these longer hemlines and dress appropriately for those events without losing her style completely and who she is. She’s still Meghan, and that’s not going to change. But she’s always had that great sense of style and fashion, in reflecting back over the years and looking at all these different outfits that she’s worn. She’s always worn longer hemlines too. I think we’re always going to see Meghan as Meghan. So I think we will see a mix. When there’s more formal events, you’ll see the longer hemlines or the more streamlined, tailored looks. And when it’s a more relaxed event, you’ll see a different look. That more relaxed feel. The messy bun. I feel she is doing that so that everyone around her feels comfortable in those events, that they don’t feel like oh there’s somebody here that’s so royal and formal and we have to act a certain way. So they feel more comfortable with her, with her personality. I think we’re always going to see Meghan as Meghan, and I really hope that she doesn’t change too much. I love the type of outfit she wears on the walkabouts where she’s a little more casual. She’s just so good at wearing a professional woman’s coat. You know? Courter: That corporate look! Business, but not overdone. Markle on a walkabout in Belfast, Northern Ireland. Okay: wedding dress guesses. What’s the look? Courter: I have felt strongly from the beginning that it would be Roland Mouret. Part of that is because of her relationship with Roland. They have been really good friends and he knows her style and what flatters her and she tends to gravitate towards somebody she knows and knows her style, and he is a British designer. And I feel like she’s going to wear something that’s very tailored, with clean lines and a little bit of whimsy—not a lot of lace or too much appliqué, overdone in sequins, or anything like that. I really feel there’s going to be two dresses. We’re going to see Erdem somewhere along the way. Stella McCartney came to mind at one point, and most recently Susan and I have been discussing something else that came up, and I’ll pass that off. Kelley: I think that Susan’s theory about Roland Mouret is pretty good. Because of the way Meghan is so savvy at exposing smaller brands, I think she really gets the positive elements of her position and the way that exposure of smaller brands can help companies. That’s been demonstrated. But I also think she likes dealing with smaller boutique brands. We could well see a gown for probably the second reception from a small, boutique British brand that would play to her penchant for that. The first gown, I think as Susan said, there are other designers but it could well be Roland Mouret. But there’ll be surprises. I think we’ll see surprises in terms of the gowns and the accessories. If, say, the morning gown is Roland Mouret or Erdem or whoever, I don’t think she’ll necessarily go with shoes by that brand. She may want to spread the wealth, for a lack of a better term, and expose more brands to the spotlight. Courter: Sarah Flint makes wedding shoes, and when we discussed this, I said, you know, I wouldn’t be surprised if we see Sarah Flint mixed in there. She’s been dedicated to her line for quite some time. Most recently she’s been wearing a lot of Jimmy Choo and Manolo Blahnik. But on the flipside, more recently, we’ve noted that she’s been wearing a lot of designers that had been on the original list of potential dress designers for the wedding dress, and we’re wondering if perhaps that’s a hint as to who she won’t be wearing on the wedding day. She was carrying the little Roland Mouret purse recently, she’s worn Emilia Wickstead, she’s worn Amanda Wakeley. Greta Constantine. A lot of Stella McCartney recently. Perhaps to just highlight them. And the ones she hasn’t worn are Erdem and all these other particular designers. But in our conversations recently about these smaller boutiques, I’ve started to lean that way a little bit more, that she would most definitely wear a smaller British boutique. What was that one, Susan—Caroline Lepley? Kelley: Phillipa Lepley, and Caroline Castigliano. Rounds would be another one. The old school, very discreet, bridal designers that have historically catered to an upper-tier bride. Courter: Everyone is zoning in on Ralph and Russo, because she wore that for the engagement photo shoot, but most don’t realize that recently, when Alexi, the photographer, was interviewed casually on the red carpet, he had said that Meghan had several outfits to choose from the day of, and that dress happened to be hanging there by Ralph and Russo and she just put it on and she felt comfortable in it. It wasn’t necessarily the dress that she was going to wear for that photoshoot. I think everyone just kind of jumped on it and said, oh, you know, maybe that’s the designer she’ll wear. But she had a series of outfits to choose from that day. People miss those little details, and those are the things we end up picking up on. Kate Middleton in the “Lotus Flower” tiara. Is she gonna wear a tiara? And what’s your best guess? Courter: I really hope she does, and I think she will. I dont know, we’ve discussed a few different ones. I dont really know which one it would be. That’s a tough one! Kelley: I do think she will. I think there’s a very remote possibility we could see her do a variation of what Sarah Ferguson did. She went in with a crown of flowers. When she came out, she had on a tiara. I think it’s possible we could see a new tiara. I think it will discreet. I think it will be smaller size. It will not be gaudy or loud or anything of the nature. Or she might do some sort of jeweled hair ornament. I think of Pippa Middleton’s—there are other well-known women who’ve worn that sort of thing. So she’s got the fun of having diamonds on your head—life goal! Diamonds on my head! Courter: I don’t see that happening. That’s a Spencer family piece and it doesn’t seem like they would do that for this particular day. It’s the Windsor line, and I just don’t think that that would happen. I would love it to be—which is it, the girlfriends one? Kelley: Oh, the Girls of Great Britain and Ireland. That’s one of those massive, I mean really giant tiaras. The Cartier that Kate wore, I don’t think she would do that. The Lotus Flower is a very low-key one that Kate has worn twice, I think—I think she’s very sensitive to not wanting to be perceived as stepping on Kate’s fashion territory. Correction: A sentence in the second paragraph was lightly edited for clarity. Also, designer Roland Mouret and label Reiss were misspelled; we regret the error.